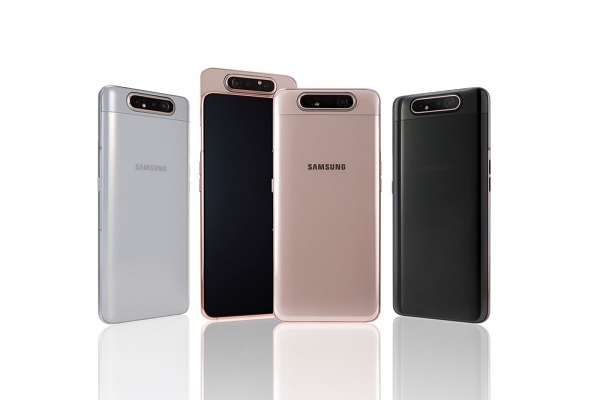 Samsung added to its Galaxy A-series product line with the introduction of a novel camera arrangement in the Galaxy A80 designed to address the ongoing notch challenge. The device has a slider form factor but, rather than having a separate front camera array, has a module which rotates from rear-facing to forward when device is opened. This also has the advantage of giving the same quality imaging whichever way the cameras are facing, without the need for duplicate hardware. Galaxy A80 has a 48MP main camera, with secondary 8MP ultra wide camera, and 3D depth sensor. The rotating camera arrangement means there are no notches or cut outs in the 6.7-inch full HD screen. The device also has Dolby Atmos audio technology to enhance audio when using earphones or Bluetooth speakers. Featuring a 3700mAh battery with super-fast charging, the company said Galaxy A80 also includes intelligent battery technology to learn daily routines and app usage patterns to optimise power consumption. Powered by an octacore processor, it offers 8GB of RAM and 128GB of internal storage, with no expansion option. Galaxy A80 is available in three colours: angel gold, which is said to include “elements of pink”; ghost white, which has “some blue characteristics”; and phantom black, which is black. Samsung made a number of updates to the Galaxy A-series, which is the more mid-tier sibling to the Galaxy S and Galaxy Note flagship lines, in recent months.